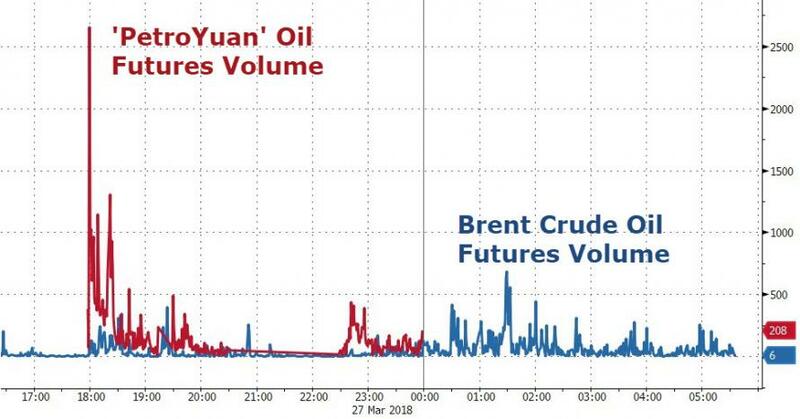 Any sentiment that market mechanics, higher fees, or other impediments to widespread participation in the petro-yuan would impede its immediate impact are falling by the wayside as quickly as they arise. Some analysts believed international investors would be discouraged to tap the Shanghai oil futures. If the first day of trading is any indication, however, this is not the case, at least not for large commodity trading firms. As OilPrice.com's Tsvetana Paraskova notes, Glencore, Trafigura, and Freepoint Commodities were among the first to buy the new contract, Reuters reports. 62,500 contracts traded in aggregate, meaning over 62 million barrels of oil changed hands for a notional volume around 27 billion yuan (over $4 billion). Bloomberg reports that contract grades in Shanghai crude oil futures exchange could account for around 200 billion yuan in trades, based on China’s current import volumes, helping the nation in its efforts to internationalize its currency, Wood Mackenzie’s research director Sushant Gupta.